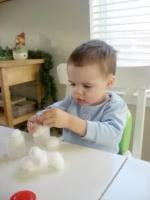 I was going to wait a while for this activity but when my son wouldn't stop playing with them, I couldn't wait to share. The idea came from my son and his constant stacking of cans, spices and boxes of mac and cheese. 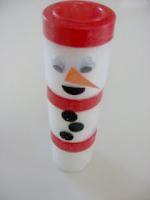 It is super easy and although we kept our decoration to a minimum you can glue whatever you want to embellish your snowman! 1. Gather your materials. 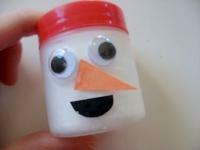 You will need 2 or more small, plastic spice jars, some construction paper, googly eyes, glue, scissors, and cotton balls. 2. 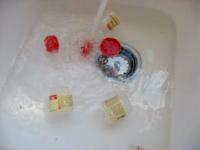 Soak your empty spice jars in hot water to remove all the glue and labels. Let dry. 3. 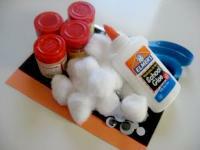 Fill your spice jars with cotton balls, count as you go! Put the lids on tightly. 4. While your child does that, cut out some black circles for buttons, an orange triangle for a carrot, and a black semicircle for a mouth. 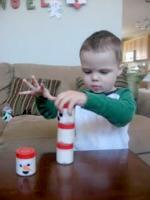 You can also do arms, a broom, or more, I kept it simple for my 2 year old. 5. Add glue and the buttons to one "block". 6. Add the googly eyes, carrot and mouth on another. 8. 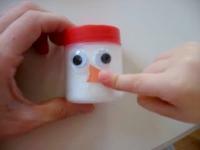 Build your snowman! My son has been enjoying putting the head on the bottom and laughing hysterically!